Unfortunately we don’t have a photograph of these two houses in Thornbury, but we know there was a building there in the 1840 Tithe Survey, and it shows that the properties were on Plot 325 – house and garden owned and occupied by Daniel Pitcher. We don’t think Daniel was living in the house as he was shown in the same survey as owning and living other properties. 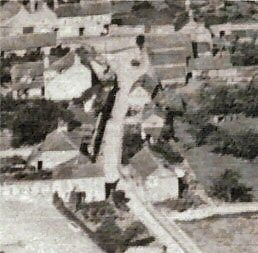 The aerial photograph below shows Bath Road running vertically from the top of the photo to the bottom. Numbers 2 & 4 are the large building on the left of the photo near the top. The only clues we have about what the property later known as 2 and 4 Bath Road was originally and how it was use lie in the deeds and documents held by South Gloucestershire Council in relation to another property, 57 St Mary Street. Daniel Pitcher – the 1841 shows Daniel Pitcher living at 24 High Street with his wife, Bethia. Daniel was a saddler aged 60 and Bethia was aged 40. Daniel was born about 1775, the son of Daniel Pitcher and his wife, Elizabeth. We suspect he may have been baptised at the Presbyterian Old Town Meeting House in Wotton Under Edge on 22nd February 1775. Daniel married Mary Forest from Olveston on 14th November 1811. Mary died on 27th July 1822. His second wife was Bethia Taylor whom he married on 1st December 1822. She was the daughter of Joseph and Aurelia Taylor born on 30th July 1791. In the 1851 Census they were still living in the High Street with Daniel aged 77 and Bethia aged 56. Daniel had a saddler and harness making business which was located on the High Street near the Market Place. Daniel died aged 77 on the 19th July 1852 and was buried on 26th July. In his will, made 14th September 1849, he left everything to Bethia. Following his death Bethia sold the business and the advertisements for the sale showed that Daniel had been trading there for over 40 years. We know that Daniel was a deacon of Congregational Church and in 1825 he provided the Church with land on the junction of what is now called Chapel Street and Rock Street to enable them to erect a new church. The land was sold to the Church for £145 and the new building completed by September 1826 when a certificate of Registration of the Chapel for Worship was granted. The 1859 and 1862 Rate Books shows ‘Mrs Pitcher’ as the owner and occupant of the premises in ‘Bulls Lane’. The 1861 census shows that Bethia was now living the house which later became known as 2 Bath Road and that she was described as a ‘landed proprietor’. Bethia died aged 72 on 8th January 1864 and was buried on 12th January. The image on the right shows a sale notice for the property published on 7th May 1864. It gives a very good description of the property at that time. Bethia died intestate and letters of administration were granted to her half brother John Trotman. Bethia had two sisters; Mary Taylor who married James Jenkins of Chepstow and Unity Taylor who married William Bennett of Thornbury. The heirs of Bethia Pitcher (Unity Bennett, Joseph Jenkins William James and David Thomas) sold the properties in Bath Road to John Honeyborne on 2nd August 1864. John died on 29th December 1867 aged 38 and his wife, Emma, inherited the properties. Following Maria’s death, the Honeyborne property was divided between the three sons. Arthur Land Honeyborne acquired the house in Bath Road occupied by Sherborne and Maggs, a trap-house in Bath Road occupied by Albert Bagg and a leasehold house in St Mary Street occupied by John Radford. We don’t know much about Arthur. Arthur didn’t live in the town. He married Gladys Salmon in Bristol in 1918. In 1930 he was living in Herbert Street, Eastville in Bristol. He was buried in Thornbury following his death on 29th March 1966 aged 75. The sale of 2 and 4 Bath Road was advertised for 12th June 1956, by which time 4 Bath Road was said to be vacant. The property next door (2 Bath Road) was tenanted by the Riddifords. Number 2 Bath Road had two bedrooms with a sitting room, dining room and kitchen on the ground floor. There was a coal house, shed and W.C. in the garden. Number 4 Bath Road was said to have three bedrooms with a sitting room, dining room and kitchen on the ground floor. A “back kitchen” contained a sink and a boiler and a W. C. The property also had a stone built shed which led onto the road and a garage, It also had a shed with a loft over it which was let out. The houses at 2 and 4 Bath Road were still standing in 1965 when the Council were planning the re-development of central Thornbury. On 6th January 1967 Ben Salisbury who was living in number 4 sold both of these properties to Gloucestershire County Council for £6000. They were demolished to make way for the ornamental garden alongside the Police Station.